Not only was it convenient for dinner as it was just a few meters down from Kanip-aw Lodge where I was staying but the food was consistently good and servings were hefty. Serving Western dishes, the orders often came quickly as I guessed the sauces and meats have been pre-pared. The pastas are good for hungry eaters as the servings are quite huge. Recommended is the Sagada Brew Pasta which is has a sweetish tomato-based sauce with etag bits. For lighter dinners, I had the Sausage and Bacon Sandwhich which I really loved as the filling was quite generous and the saltiness of the bacon and sausage was a perfect counterpoint to the sweetish dressing. I liked it so much that I had it thrice. 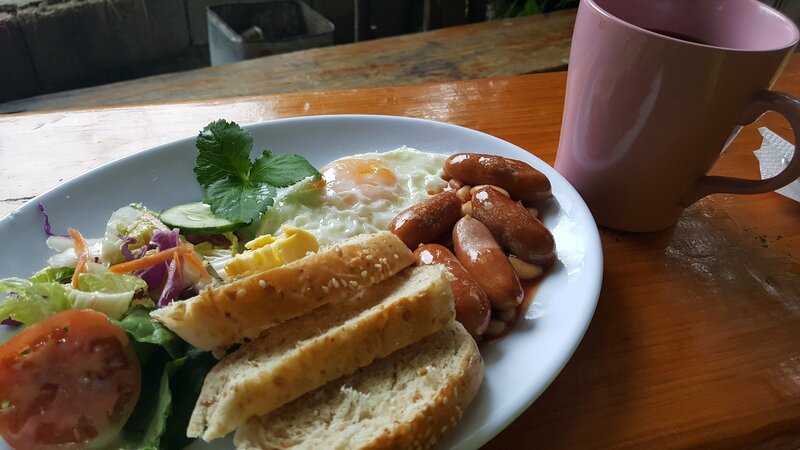 For breakfast, I tried the Sausages, Beans, and Egg served with 3 pieces of toast and a side salad. The breakfast sausages had a delicious smokey taste while the beans were, I guess, Hunt’s Pork and Beans. I enjoyed the sweetish vinaigrette of the crisp side salad. It’s good to come here just as they open at 7 so you can grab this sweet spot and savor the quiet before vehicles come rumbling down the road. They have cakes but at Php 150 each, I found them quite steep. The Salted Caramel Banana cake was good though but it didn’t really taste like a cake. It was more like a dense pancake or loaf. The bonus is the citrus-infused table water. 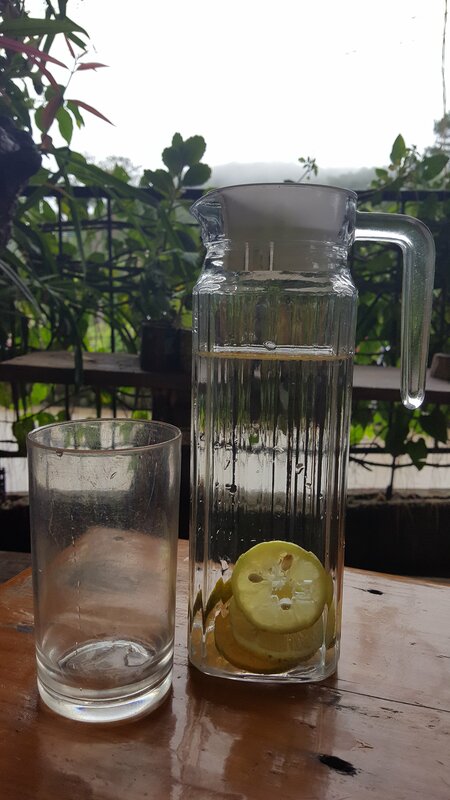 What’s funny is that in the menu for the lunch and dinner sets, it says that they come with bottomless citrus -infused water. Perhaps, it used to be part of the meal sets and not available to everyone? The inside is a little cramped though as tables are connected to each other. I preferred staying at the benches outside. Quieter and more atmospheric. 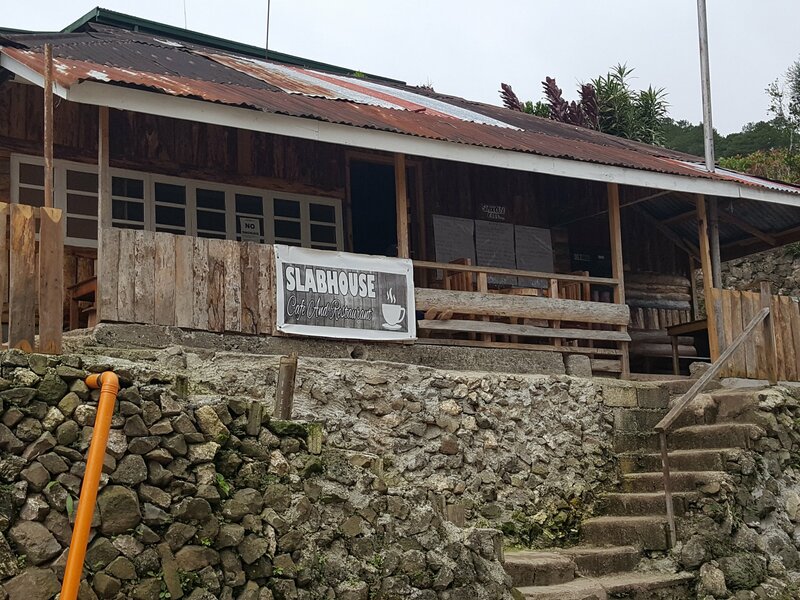 Sagada Brew does everything right from the homey atmosphere to the generous and tasty food to the quick and friendly service. I really loved Sagada Brew. 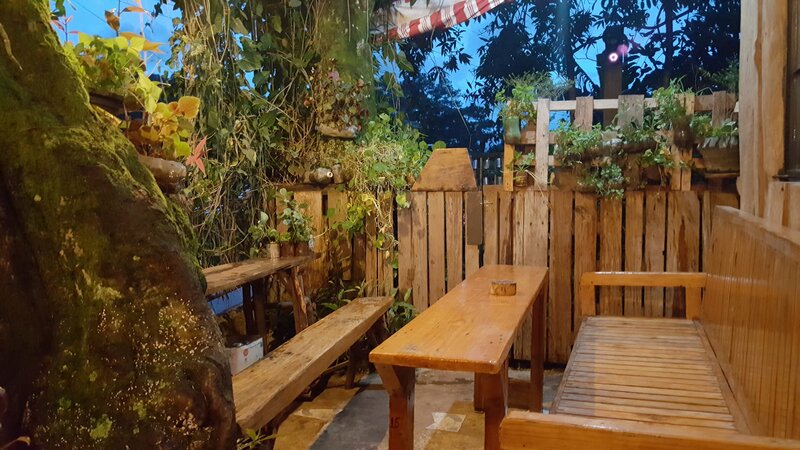 On my last night in Sagada, I had dinner there again I felt quite sad leaving the place. The owner chatted me up and she’s a really nice lady who feels for her newly-adopted community (she’s from Pampanga). With its limited menu (only 5 items and all chicken dishes) you come here either for cheap heavy breakfast sets (Php 100, 2 choices) or lemon pie (Php 30) or tea and coffee which is a pity as the place is nice and the toilets are clean (there’s a bidet). If you like your lemon pie with the tartness of lemon, you would find their version bland. If you have knee problems, the low seats might be a challenge. Made me feel cute and slim while seated, though. You can also sit on pillows on the floor. To each his own taste of lemon pie but I feel it could up the tartness level of the pie. With such a large space (there’s a lower level with proper tables and chairs) they could have gone full service with meals to maximize the place’s potential. Read so much about this place in blogs that I made it a point to come here. 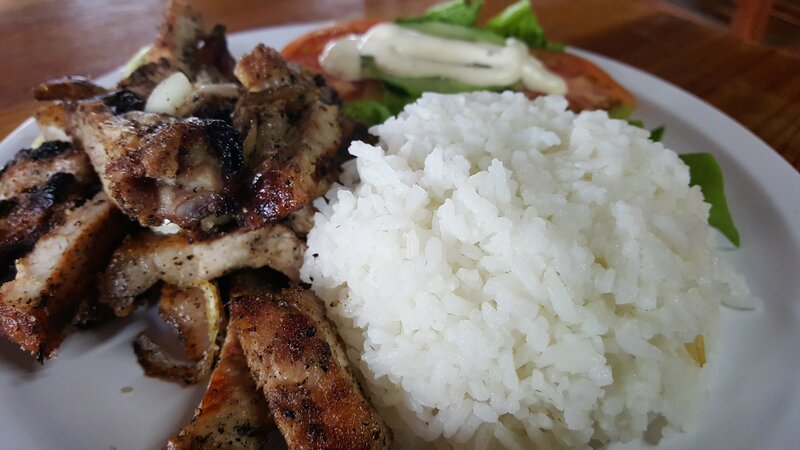 Ordered the dinakiw which was grilled pork. It came in hefty servings with rice and vegetables. It could have been salted better but at least the meat was quite tender. The walnet peanut butter cake did deliver on taste but it was too dense. Inspite of it being in the refrigerator rather than a cake chiller, it wasn’t dry. The place was quite full with groups but contrary to what I had been reading, it didn’t seem to have taken 30 minutes to serve the food judging from the group that came in a few minutes after me. My dinakiw arrived less than 10 minutes. Salt & Pepper has a varied menu– pasta, pizza, wraps, local food. I had lunch again at Salt & Pepper and this time, the teeming masses had gone as it was a work week. I was the only one at the resto! I ordered the sinarabasab which is pork marinated in vinegar. 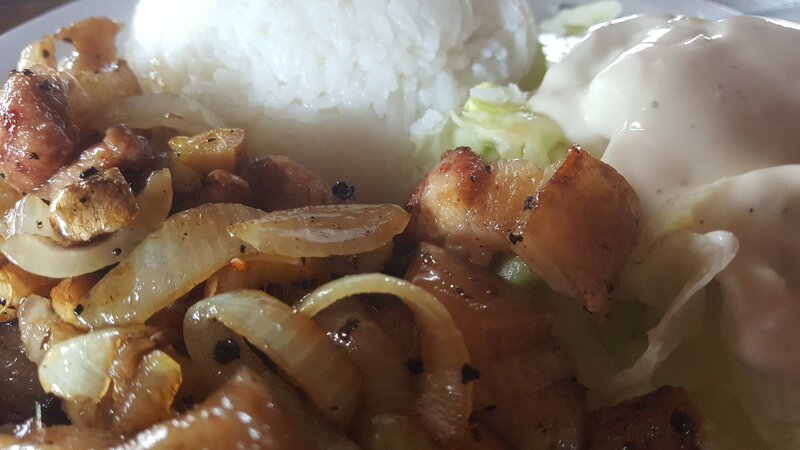 It was soooo tasty as the sweetish vinegar was balanced by the sauteed onions and ginger. I tried writing down the recipe based on its taste. Partnered, with steaming hot rice, it was perfect! 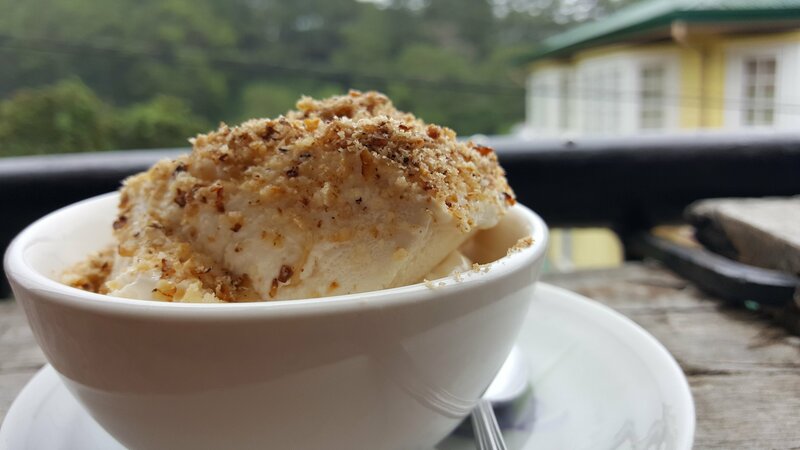 The pork etag sisig was just as good as the smokey salty taste of this Sagada delicacy was just perfect. Serving size was smaller though. I guess it’s because etag is quite expensive. The chalkboard on the counter announced more Western-oriented dishes. Service was friendly and efficient though a bit slow when taking your orders. The best thing is they accept credit and debit cards! I used my AUB ATM card just to see if it would work and it did! So if you’re running low on cash or the ATM at the tourist center is off-line, you know where to swipe. I’ve only ever had yogurt here even in past visits and it never fails. It was thick and nicely textured and just had the right amount of sourness. A plain bowl is Php 100 while having it with granola and bananas adds an additional to Php 10. The mains are little bit more expensive than the other restos (Php 190 and above). The aroma coming from the kitchen is good, though. Grab a seat on the terrace for yogurt with a view. One of the cheaper places to eat for no-frills Pinoy food. There are cooked mains such as pork binagoongan, nilaga, adobo, and pinakbet. I didn’t enjoy the binagoongan much as it lacked the saltiness of .bagoong. The meat wasn’t very tender too. 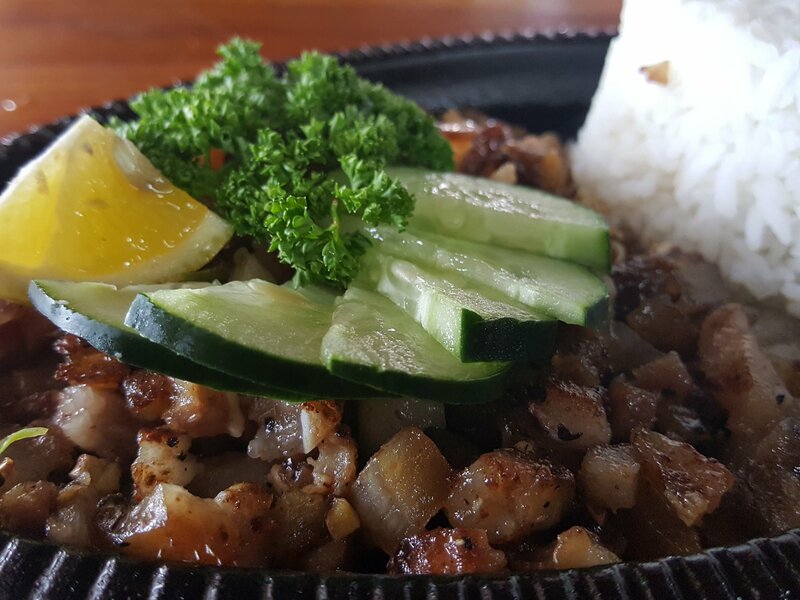 The sisig was good and only costs Php 120 just like the mains. Servings are filling and come with mountain rice. They also have short orders of pancit. Service was good and efficient. The place is just across Masferre. 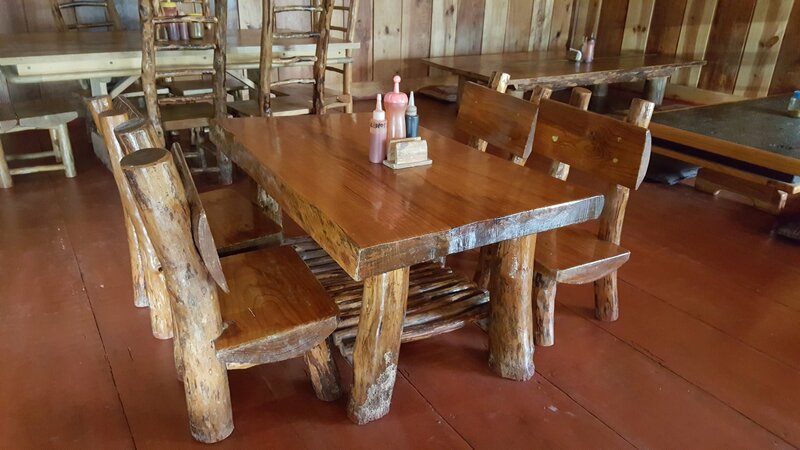 Tried this place across Sagada Igorot House as it had nice wooden tables and benches at a veranda overlooking the road. Unfortunately, the lechon kawali (Php 120) had a malansa taste as it was not very well fried hence it had the bpiled pork taste. 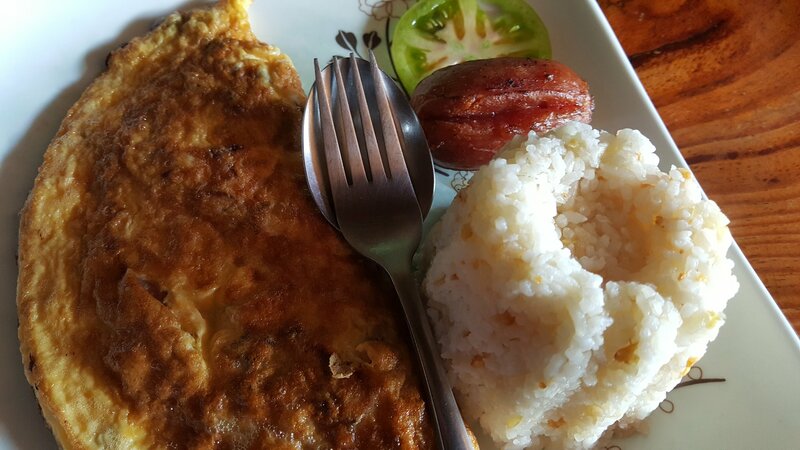 There are other unassuming eateries at the town center for those on a budget. At the basement of the complex just beside the tourism office are cheap eateries where locals eat. You can also head to the canteen at St. Theodore’s. Cheapest of course would be to head to the public market to buy stuff and cook them at your lodging place if they have a kitchen for guests to use. I eventually did this for breakfast and dinner and only went out for lunch. I saved tons of money this way. 1. Don’t expect professional service. 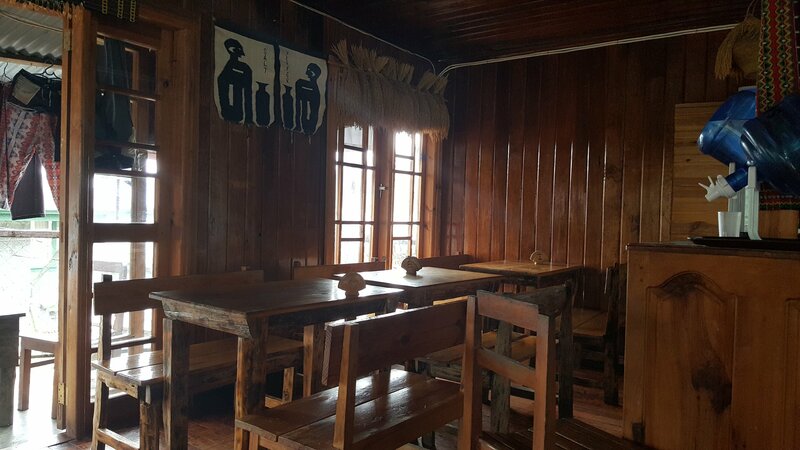 Many of the dining places are converted houses with the family members or hired locals running the place. 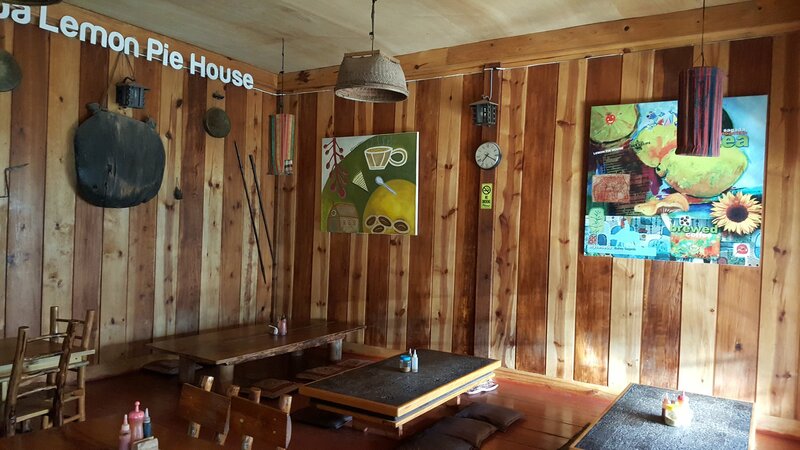 True to the slow pace of life in Sagada, service follows the same rhythm. Food is also usually cooked from scratch. The trick is to go at off times such as 11 am for lunch instead of 12nn. Don’t wait until you’re hungry when you decide to head out for lunch or dinner. Think of a 20-minute wait. 2. Manage your noise. This is a personal thing. Places are usually small. 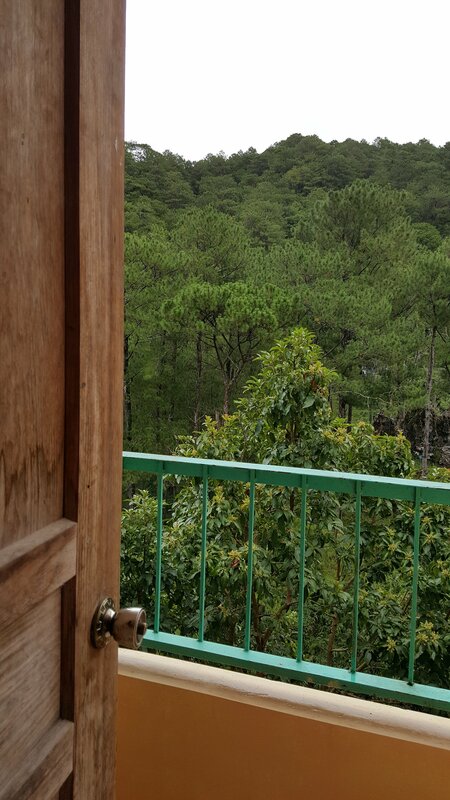 Keep the nice Sagada ambience by not sounding like you’re in one big brash tour group (even if you’re really in one). 3. 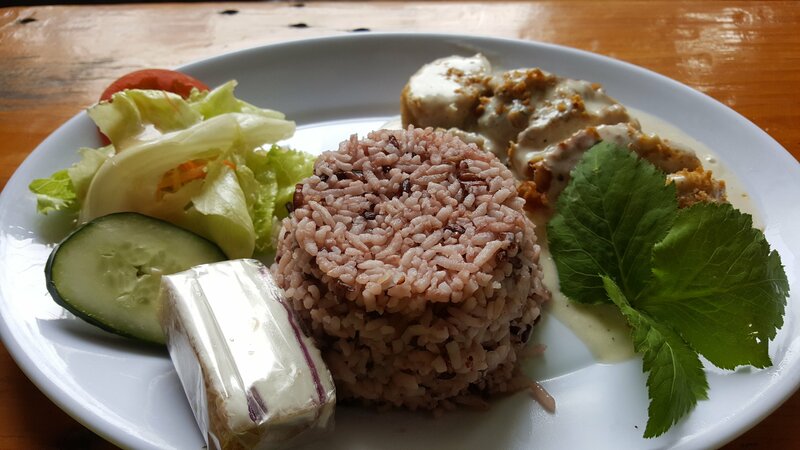 Meals are in the range of Php 150 – Php 250. Some places like Masferre go up to Php 400. That being said, portions are generally generous. Also remember that for Western-oriented dishes, many ingredients are brought in from miles away like Baguio. 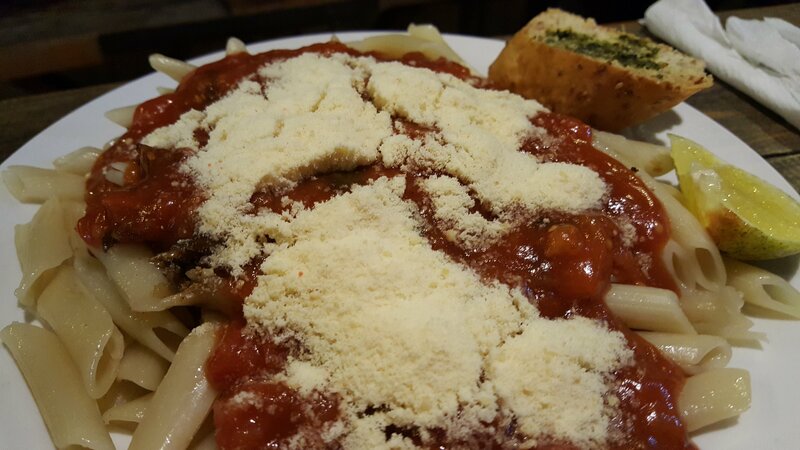 Yup, that parmesan cheese on your pasta is not available in any store in Sagada. I woke-up at around 4.30 in the morning to all the noise the family staying at the rooms at the next building was making. Why can’t people be more considerate? Managed to get back to sleep and woke-up at a little past 6. Still too early for breakfast so I decided to do some squats but then realized the time would be much better spent choreographing a warm-up for my Zumba Step (Yep! My other life is at Zumba). Jotted it down on my S Note before heading to Sagada Lemon Pie House for a breakfast set of onion and cheese omelette, fried rice, and longganisa (Php 100) plus a slice of lemon pie (Php 30) and a cup of coffee (Php 30). The breakfast set was good though the longganisa could have been bigger. The lemon pie was so-so. Not lemony nor tarty at all. In my taste buds, I had the lemon bars of Purple Oven as benchmark for all things lemony. Savored the silence and the rustic feel of the place before a young couple with an over-active child and a hippie couple came bustling. I could have stayed at my own corner of the world forever especially as after the others had left, I was alone again. Checked my email when I got back at the lodge and saw Dr. KB’s email with my 3 questions! Since the sun was shining, I decided to do 2 pieces of laundry before hunkering down to work with the most tedious question, one that asked for a brief thesis proposal. 1, 230 words, I decided to have some lunch. The rain had stopped by then and I was hungry. 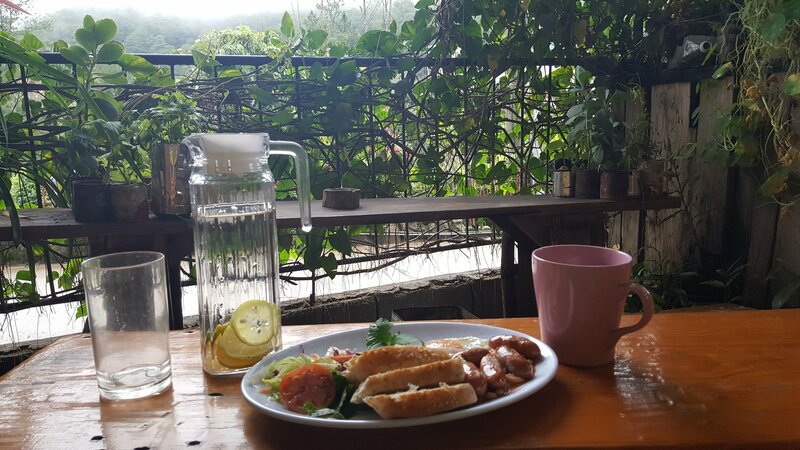 The safe choice was Sagada Brew where I ordered the Chicken Roulade (Php 200). It came with a salad, a cup of local rice, and a brownie. All good! Back to work finishing 2,500 plus words at close to 7. By this time, a group of noisy girls and gays had moved in the room occupied by the noisy family previously (perhaps it’s where noisy guests are placed). Just to have a respite from the girls’ yakking (the gays had gone out ), I decided to head out for dinner instead of staying-in with my stash of bananas and oranges. Headed to Sagada Hub but it’s Pinoy menu didn’t appeal to me. 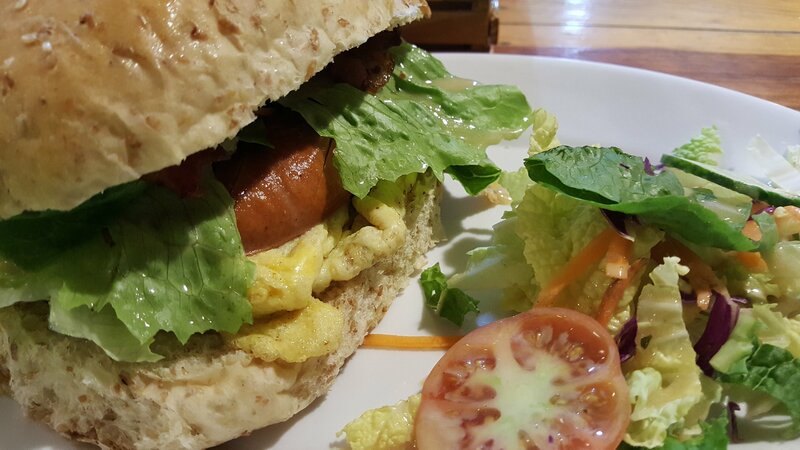 Back to Sagada Brew where I had a yummy and hefty sausage and bacon sandwhich on home made wheat bread (Php 150). Sorry, forgot to take a picture. Three times of eating here and I have yet to be disappointed. Back to my room and the noisy girls are still at it. Oh well. I finally got to check-in at my room at Kanip-aw and just as Ate Eppie had promised, it had a terrace. It was at the lower level of the lodge, though, which meant going down two flights of outdoor stairs and up a short one. I didn’t mind as I had gorgeous views of Echo Valley plus I would need the exercise (yes, I promised I would not gain weight on this trip). They would have given me a bigger room but as I told them I needed some quiet, they opted for this one as there was some re-tiling going on at the building where the room was. I was happy with the room they way it was. Had lunch at this small place which had pre-cooked food. 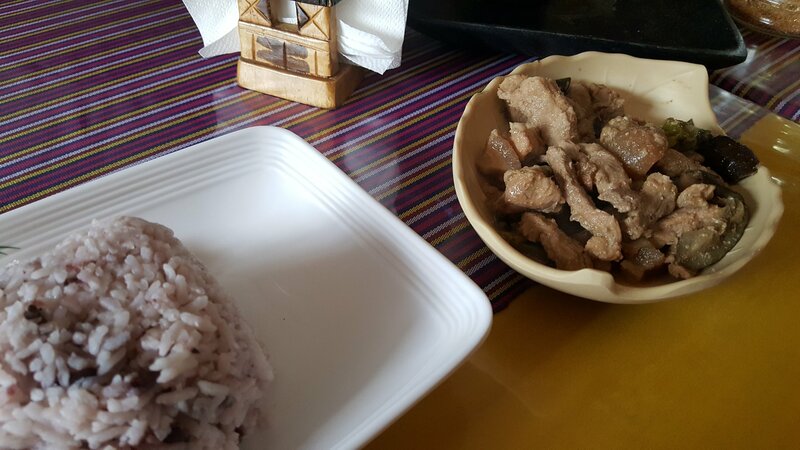 The pork binagoongan was nothing to crow about as the meat was quite stringy and lacked the saltiness of the bagoong. At Php 110 plus a cup of red rice, it wasn’t good value. The sisig the others were having looked more promising. Spent the rest of the afternoon just lazing around in my room enjoying the cool weather and quiet until a group of tourists came into what I assumed was the common area at the lower level and their noise wafted into my room. It wasn’t really bothersome as they weren’t boisterous. More distracting was what seemed to be videoke coming from somewhere. Thankfully, it didn’t last long. I did see a videoke at the lobby of Sagada Igorot Inn as I passed by it. Made me thank the heavens I didn’t book there. Went out close to 6pm for early dinner. Checked out the menu of Sagada Lemon Pie House and only saw Chicken Adobo, Pork Adobo, and Fried Chicken listed apart from the breakfast. There were tins of the much talked-about lemon pie, though. Headed up the road and decided on Sagada Brew mainly because I saw the pastry counter. 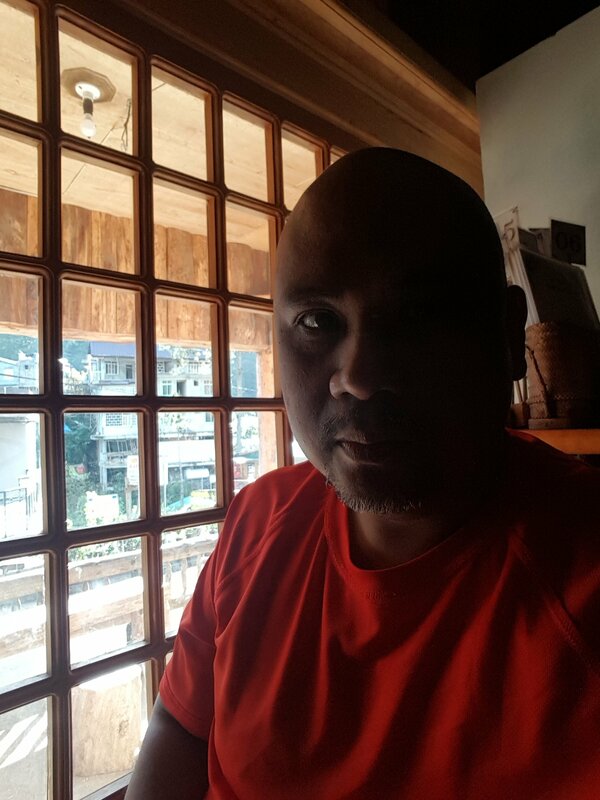 I ordered the Sagada Brew Pasta which was a heaping plate of penne smothered in a rich tangy tomato sauce with etag (a local salted pork delicacy). Expecting quite a wait, I also ordered the Salted Caramel Banana Cake. 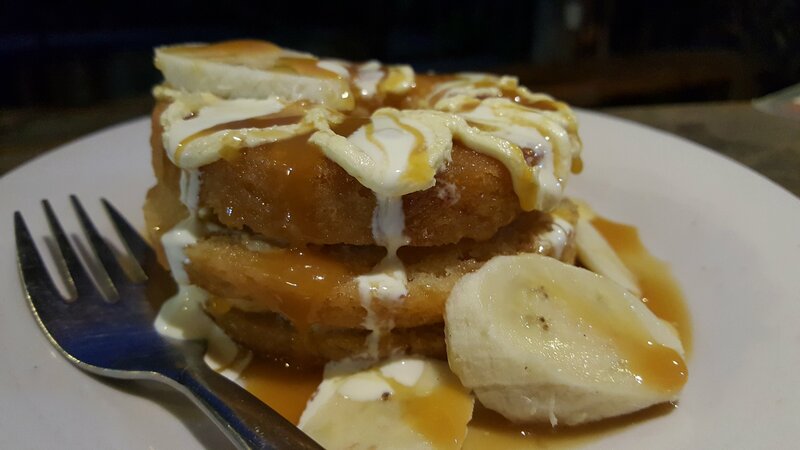 The cake was more of a dense loaf smothered in syrup and cream and topped with bananas. I was surprised at the price tag of Php 150, the same as my pasta. Well, flour does take longer to rise in higher altitudes. It was good, though.